HOLLYWOOD, Calif., September 25, 2018 – @SunstockSolFest 2018 is less than one month away taking place for the 3rd year in Hollywood on September 20. Sunstock is voted by fans as “THE BEST of 2018” all-ages block party. 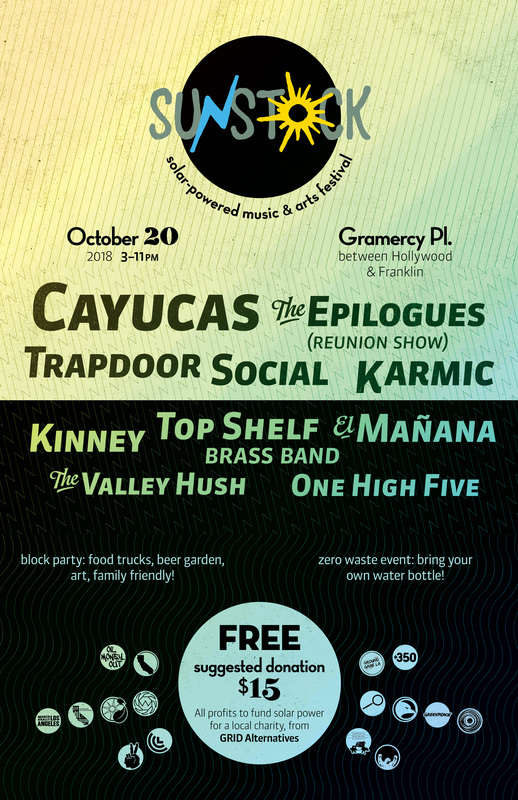 The Festival features Solar-powered live music by Cayucas, The Epilogues (Reunion Show! ), Karmic, and more. Organized by local band/activists Trapdoor Social, Sunstock features great food and drinks (show ID if 21+). BYOWaterBottle for this Zero-Waste event. The excitement happens on Gramercy Place between Hollywood Blvd. and Franklin Avenue. Hours are 3-11pm on Saturday.